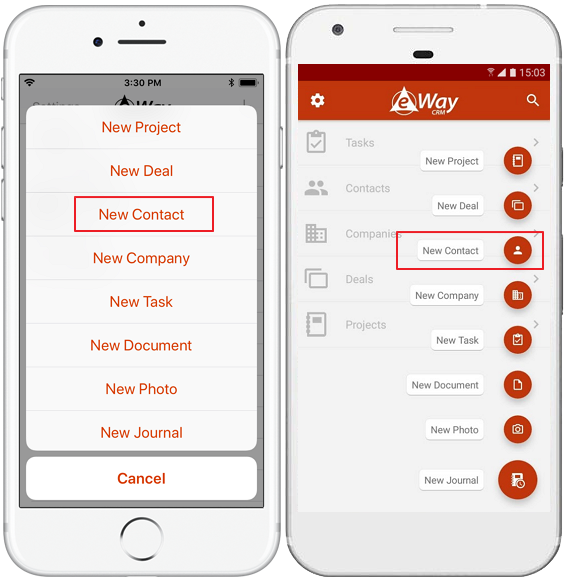 Creating of contacts, companies, deals and projects in eWay-CRM Mobile has similar attributes, so the description below will be presented only on contact. You can create new contacts or companies in two ways - from main window or from the list. 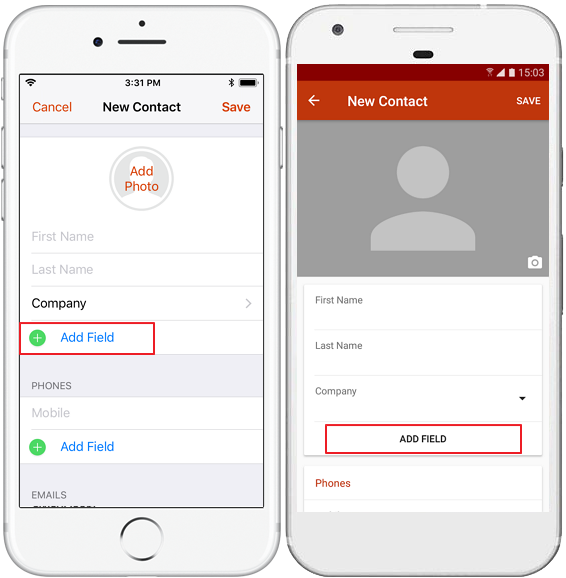 Note: Create company as first, because if you have company and you will add it to the company field on contact, the address from company will be automatically filled to the contact, so you have no need to fill it manually all over again. Important: This function is available only on smartphones with Android 7.1.1 and higher. Although, the default setting of phone could disabled this function. 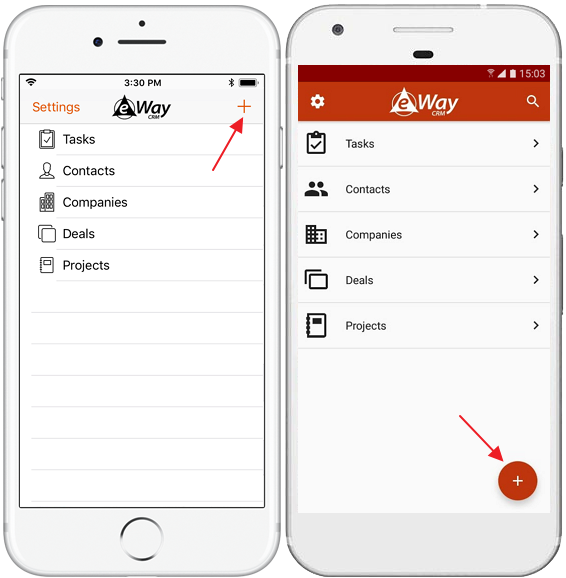 If you want to create contact or company, just push and hold your finger on the icon of eWay-CRM Mobile. You will see context menu as in the picture below where you select what item you want to create. Availability: This function is currently available only for phones with Android. 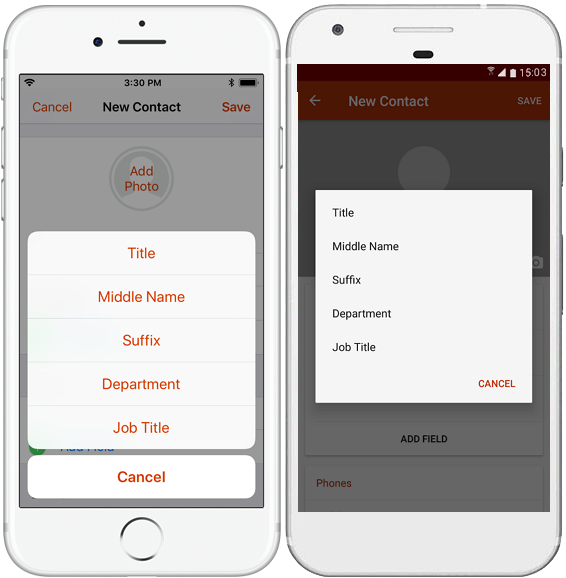 If you want to share contact from your Contacts on your phone, you can use sharing as business card (vCard). 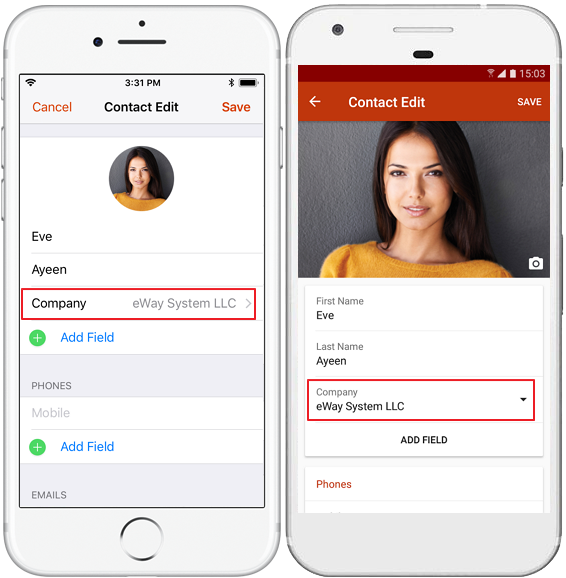 If you will share contact to eWay-CRM Mobile, application will move data from business card to fitting fields so you do not have need to insert values manually, you just save your new contact in eWay-CRM. You can fill in all values you need. There are only default fields displayed but you can add others by tapping Add Field and select fields you need. Just tap on field you want to add. Save the item when your editing is done. If you want to empty, for example, date field, you need to tap and hold the field while you edit the item. Context menu will pop up and you can erase value or select other options. You can erase value by tap-and-hold on any field type. 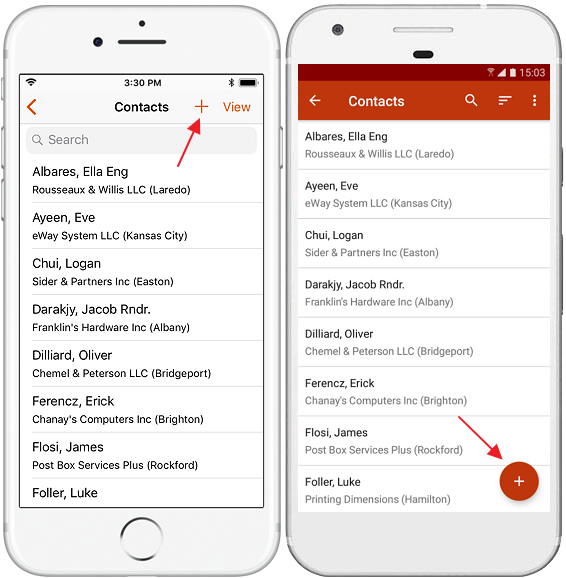 On contact, you can add company in company field - you can add it from the list or as a text. 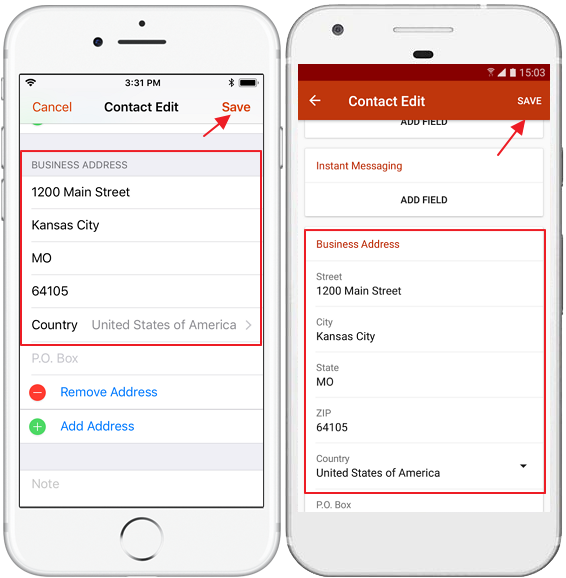 If you select existing company, eWay-CRM Mobile prefills its address to contact's address fields. You can create new items, but you can also edit already existing ones. Open item you want to edit and tap on Edit option. Status change is related to deals and projects. You can change status of item in eWay-CRM Mobile same as you can do it in eWay-CRM in your Microsoft Outlook (see Workflow). If you change stats and save it, you will be unable to edit item again until the change is synchronized to server (it will proceed during seconds when you are online). If some actions are related to the status change, all these actions are proceeded. Limitation on deals: Deals cannot be moved to completed status because eWay-CRM Mobile does not support conversion of deal to project, company or contact. 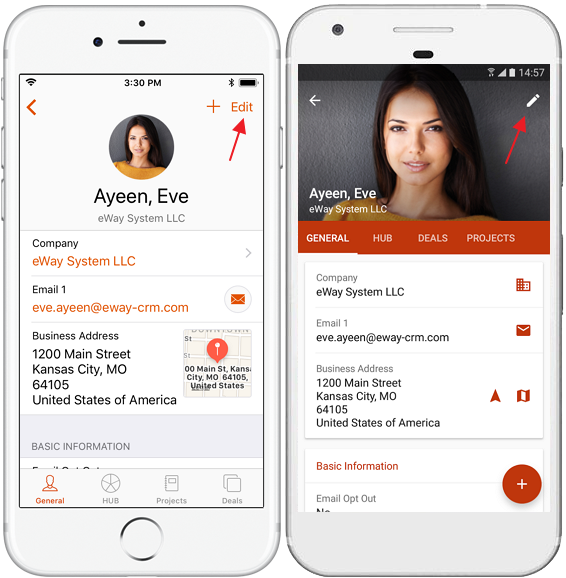 Note: Are Equal and Check Presence of Relation actions have specific process in eWay-CRM Mobile. They are checked after the user tap on save icon for save the changes. There is need to communicate with server to check actions. 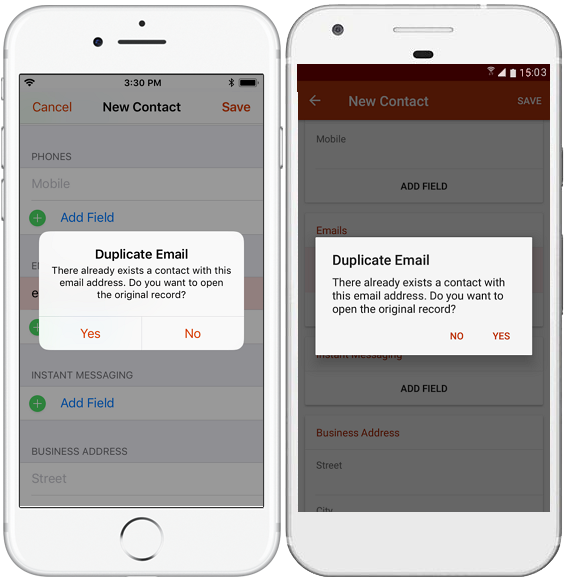 Even though the user tap on Save, if conditions of actions are not met, user will be returned to edit the deal or project to fulfill conditions of action. If the workflow contains these actions, user must be online to be able to move to the flow. It is necessary for the check of actions. Status cannot be changed unless conditions are fulfilled. eWay-CRM Mobile adapts this setting and cannot allow you o save item if there is duplicate. Application will offer you to open original item where you can make changes if it is needed.